A limitation of global climate models (GCMs) is their fairly coarse horizontal resolution. For most impact studies, such as evaluation of the future risks of floods or some types of landslides, droughts etc., the society requests information at a much more detailed local scale than provided by GCMs. Simply increasing the resolution is often not feasible because of constraints in available computer resources. A viable alternative is to embed a regional climate model (RCM) of higher resolution in relevant part of the GCM domain. RCM are complementary to GCM by adding further details to global climate projections, or to study climate processes in more detail than global models allow. An RCM domain embedded in a GCM grid. Image source: F. Giorgi, WMO Bulletin 52(2), April 2008. 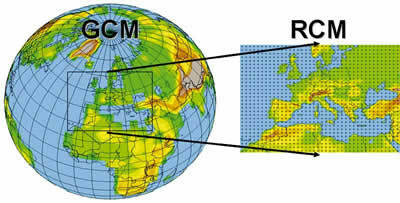 GCMs remain the primary source for projections of the range of the possible future climate from which the RCMs derive information at higher spatial resolution for specific regions. 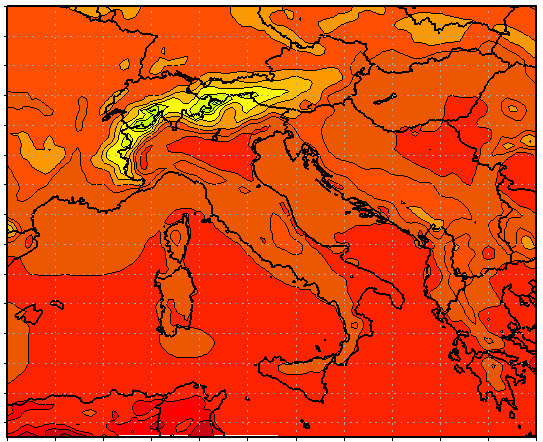 The full GCM determines the very large scale effects of changing greenhouse gas concentrations, volcanic eruptions etc. on global climate. The climate (temperature, wind etc.) calculated by a GCM is used as input at the boundaries of the domain simulated by RCM. RCMs can resolve the local small scale information about orography (land height), land use etc., providing weather and climate information at resolutions lesser than 50 or even 10 km. More recently, RCMs are used also in coupled systems. i.e. atmospheric models with other earth process models, such as hydrology, ocean, sea-ice, chemistry/aerosol and land-biosphere models. 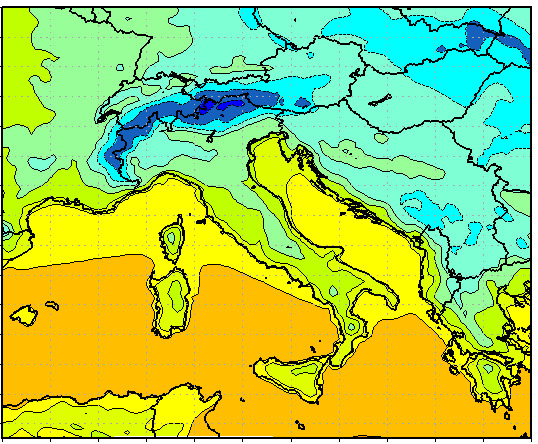 2-metre temperature distribution for Italy, averaged over the time period 1971-2000, obtained with the Regional Climate Model COSMO-CLM, respectively winter (left) and summer (right). Image Source: CMCC. RCMs have a wide acceptance in the scientific community, because they provide key input to climate impact studies, as well as to adaptation planning, dealing with possible damages and opportunities related to climate variability and change. RCMs are thus vehicles for both research and applications. IPCC AR4, WG1, The Physical Science Basis, Chapter 11.